I’m alway a proponent of trying to find more ways to work vegetables into my diet and trying to keep foods as whole and clean as possible. Crackers are one of my favorite things – crispy, crunchy and a perfect carrier for other yummy things. They also tend to be overly processed so I started looking into ways to make a healthier option at home. I came up with the version in the photo below (recipe here) and while they are delicious on their own, it seemed like they’d really be complete with a spread. Awhile back I’d made a delicious dip using edamame so I started considering what other vegetables would be good and with a big bag of carrots in the fridge the search started there. I found a recipe on The Kitchn that was sure to be packed full of flavor because of all the spices so that was my starting point. Since garbanzo beans can be hard on some people’s systems I made a few adaptions for this No Bean Spiced Carrot Hummus recipe. I hope you enjoy. Line a baking sheet with parchment and toss the carrots and whole garlic cloves with 2 tablespoons of olive oil. Roast until the carrots are tender and lightly browned, 18 to 20 minutes, stirring halfway through cooking. In a food processor, combine the roasted veggies with the remaining ingredients. With the motor running drizzle in the remaining 2 tablespoons of olive oil. Blend until smooth, scraping the sides down as necessary. Taste and adjust seasonings if necessary. If hummus is too thick it can be thinned out with a little more water or oil. Mmm, yum! I can’t wait for the cracker recipe. Those look wonderful! Thanks Tara! 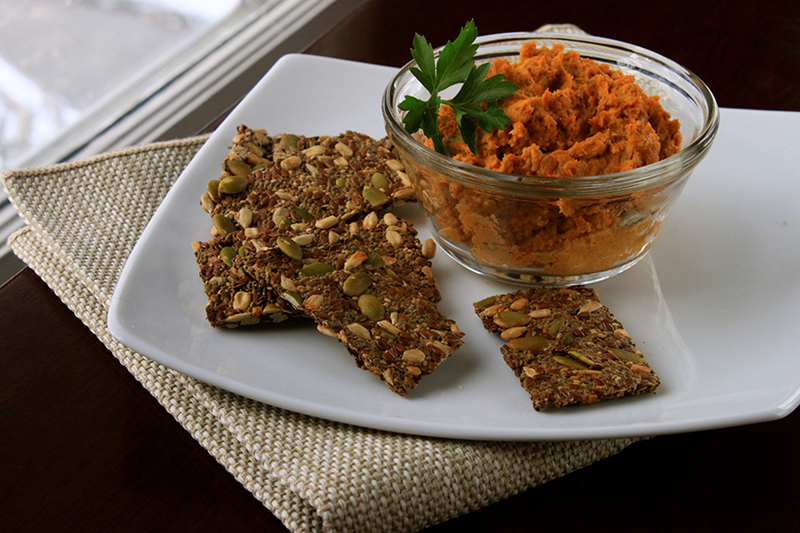 The hummus dip is full of flavor and the crackers are really great too. I’m going to tweak the recipe and make another batch and then hopefully the recipe will be ready to post. Stay tuned! These crackers were just amazing! Thank you for sharing. I added 1/2 teaspoon onion powder, garlic powder and salt. Wow!